Oh there’s plenty of concern for polluting countries like China and India, particularly given their massive populations. But they’re also not first world. The first world has to lead the way in such things as we’re already the most developed on how to combat these issues. But make no mistake there is plenty of concern about China and India in particular, and increasing pressure being brought to bear on both of them both externally and internally. I mean the pollution in China’s capital alone is driving them to try and change if just so they can see more than 50 feet in front of them during certain times of the year. Agreed. So let’s use the economic system, capitalism, that helped us to become the greatest economy in the world, to solve the problems of pollution, instead of declaring proudly that we are going to put coal workers and coal companies out of work and out of business, instead of sending the EPA out to persecute citizens who have a pond or livestock tank on their property, etc. Agreed. **So let’s use the economic system, capitalism, that helped us to become the greatest economy in the world, to solve the problems of pollution, **instead of declaring proudly that we are going to put coal workers and coal companies out of work and out of business, instead of sending the EPA out to persecute citizens who have a pond or livestock tank on their property, etc. Maybe because capitalism hasn’t helped solve the problems of pollution in this country? Capitalism is not interested in doing things the cleanest way possible normally, it’s interested in doing them the cheapest way possible. Which far too often is in opposition to the cleanest way possible. Take examples such as Los Angeles, Woburn, Valdez, etc… the capitalistic way nearly destroyed these places. It was common sense government intervention that’s improved the situation in all of these cases. Your example of coal is another one. Coal is a 19th century fuel source that is one of the most polluting out there. Government he;ping to phase it out when capitalism wouldn’t isn’t a bad thing overall. Is it bad miners are being put out of work, sure. But at the same time, it’s a technology that needs to die. How can we approach the Chinese telling them they need to move beyond coal if we’re not willing to do so ourselves? I’ve lived here in the North Carolina mountains since the turn of the century. At about 2900 ft elevation, we have no A/C, and the weather has not changed in any way to encourage us to buy it. What both of us are describing is weather, not climate. Anecdotal observations about weather are no more helpful than the constantly inaccurate computer models. Even the Warmists only claim that world temperatures have increased less than one degree in our lifetimes, not enough for us to discern. You’re right. There hasn’t been much warming to date and the climate is still “life-hospitable.” So if you are already 50 or 60, you probably don’t have a lot to worry about. Increased heatwaves, storms, hurricanes, wildfires, droughts, floods, disease spread, sea rise to date have not been much, maybe only raising insurance rates a tad, putting stress on various poor areas of the worlds, causing a slight amount to destabilization, conflict, military spending, etc, but hardly discernable beyond what’s normal at this point. What I do re reducing our GHG emissions is for the young people, future generations. The harms are expected to accelerate rapidly within 100 or 200 years or so – nothing for me to worry about personally as I’m 69 and probably won’t be around more than a decade or two. I just don’t like to have killing people on into the future on my hands. But that’s just me. I can understand completely why others, especially old folks, aren’t really much concerned. In 1955, my hometown was flood by Hurricanes Connie and Diane. It hasn’t had that kind of hurricane situation since. Someone needs to show how hurricanes are worse now. Certainly the frequency is no more now than before. The 1880’s - 90’s and the 1940’s -50’s seem a lot worse. We’re also sitting pretty here in the Rio Grande Valley. Great weather these days. It has gotten a somewhat hotter. I actually did a statistical study using some 20 years of local weather data, but not a whole lot hotter so that people strongly perceive it. And our big whopper hurricane was Beulah in 1967, decades before we moved here. They still talk about it – came right up the Rio Grande River and flooded out the area and caused great damage. Hurricanes Emily and Dolly (2005, 2008) did damage many homes here – we had to spend $500 putting shingles up that had blown away, but we were the lucky ones, so very little problem for us. And these hurricanes were nothing like Beulah. Of course, it may be getting very hot during the cunicula heatwave, from mid-July to the end of Aug, when even going from the car to the store can be very uncomfortable. Just have to remember to take water with us wherever we go. That’s why science is so important – they are able to piece together much more data than our limited experiences give us. And they use paleo-climate data to figure out what we might expect in decades and centuries to come from our current warming, maybe an extinction-level warming event like the end-Permian when over 90% of life on earth died out due to the great warming and its knock on effects, like deadly hydrogen sulfide outgassing from super-anoxic seas. That took many 1000s of years, unlike today in which it is happening in geological terms lickity-split (in 100s of years). So don’t worry about it, esp if you are 60 or older. It takes 100s even many 1000s of years for such warming events to play out. This sounds like fear mongering. It is like the threat of a nuclear strike and the threat of the world being destroyed because of sin. It is fear mongering, even the global aggregate has required extensive modification to show even modest warming. The facts are the climate models have predicted over-warming and new research supports a lower (not higher) ECS. Climate science is the only discipline where being wrong proves you were right. If people were really concerned about “trashing our planet”, they’d be a lot more concerned about the vastly more polluting countries like India and China than they would about relatively clean 1st world countries like the US and Western Europe. People can only do what they can do in their own lives, families, churches, workplaces, etc. God does not expect us to do what we cannot feasibly do, such as going over to India or China and reducing their pollution. And considering their poverty (or maybe because of it), they are more rapidly going for alternative energy than the US – the gov and media of which have been bought and paid for by the fossil fuel industries, with the American people bobbing along behind them. It is sad China and India are suffering so much pollution (and tremendous health harms and cancer villages from that)…but whose pollution is that anyway? They are making products we buy, so at least that portion of pollution which goes into making and shipping the products we buy is ours. Maybe it is because evidence has been unreliable, tampered with, and used to promote a political movement. People old enough to remember the “coming ice age” in the 70’s are not so easily taken in this time. Used to promote a political movement as it has, the fact that this has changed from a revolutionary crackpot theory nobody wanted to be true (in the 1980s) to something the vast majority of the scientific community agrees with and which basically no climatologist disputes is a telling one. 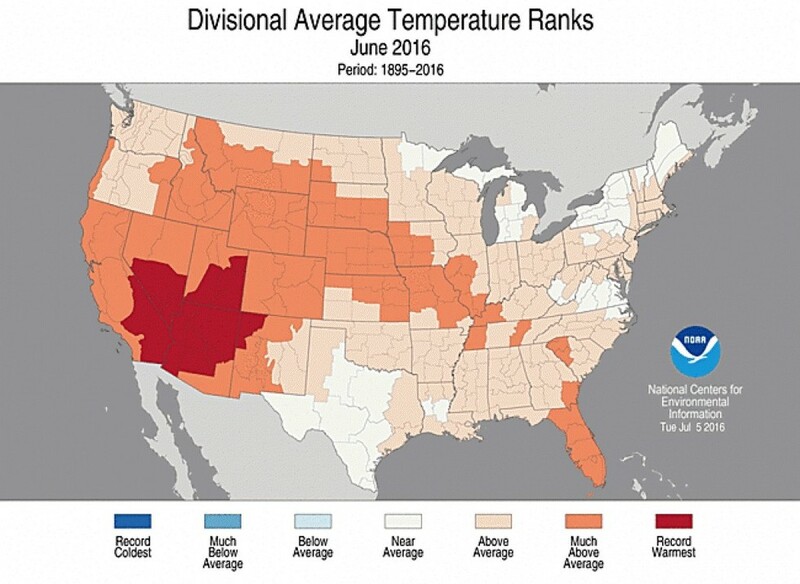 Speaking of how CC has not been perceivable in many places, here’s a US climate map for June – and I was right about my rea in the Rio Grande Valley (that tip of Texas that goes well into the heart of Mexico), which did see an average June. Other areas of the country, however, are reeling from heatwaves, wild fires, flooding, droughts, and/or tornados, etc (which are expected to overall increase with CC). I remember when everyone was worried about the “Silent Spring” when we were all going to freeze to death! Um Hm! Why are you showing us a map of weather? That what that map is, it is average temps for one month for one county, which is a very small percentage of total earth’s surface, and for which you have been telling us, is less important than temperatures in the ocean. And the lines dividing the states appear to be subjective boundary drawing. The Minnesota lines correspond with the lines drawn by the Regional Research Center, for the purpose of historical societies… Anyways, this above average month can be wiped out by a below average month, heck an above average year can be nullified by a below average year. Make up you minds, is it weather or is it climate. I have said this before, but I’ll say it again. When I was a kid, decades ago, you couldn’t successfully make a hay crop out of Bermuda any significant distance at all north of Springfield, Mo. South of Springfield, you could. Today, and despite all kinds of improved strains, you still can’t successfully make a hay crop out of Bermuda any significant distance north of Springfield, and south of Springfield, you can. That’s because the growing season is just enough shorter north of Springfield to deprive Bermuda of enough growing time to work well. It needs enough “warm time” to flourish. But north of Nevada, Missouri, ranchers can grow prodigious crops of grasses like Brome and Orchard Grass. South of Springfield, you can’t, because they are cool-season grasses and they’ll burn out in the summertime and don’t have enough “cool time” in Spring and Fall to flourish. They will grow, but never well, and they die out easily. Fescue grass is a boon to southwest Missouri where I live, because it’s a cool season grass, but doesn’t burn out in the summer because it goes dormant and doesn’t try to grow during a long warm season like Brome or Orchard Grass will. But here, fescue stays green all winter, while very far north of Springfield, it doesn’t. And “tornado alley” is in the same place where it was when my grandfather was a kid. Now, I understand that all sorts of people have all sorts of computer models and core samples of this or that. But if there was all of this MMGW, one would think ranchers in northern Missouri would be cutting crops of Bermuda in these supposedly warmer times. But they’re not. And one would think “tornado alley” would have moved. But it hasn’t. When you start seeing ranchers in Minnesota cutting lush Bermuda hay, Jilly, maybe you should start worrying about global warming. But I sure wouldn’t hold my breath waiting for it to happen. Basically? There are many scientists who question it, certainly the unreliable computer models that regularly are wrong. I think the progressive attempts to use this issue to prompt political and economic changes are far more dangerous than the “crackpot” stage was. Well we have our own grass varieties to hay up here. There is still a farmer that hays around my in-laws place when the year is dry enough. As mentioned, the changes re climate change may be totally imperceptible to some re some aspects. Below are maps showing the shift in plant hardiness zones 1990-2012 due to climate change – not very much change in 22 years. It usually takes 1000s of year for the global climate to change, we are accomplishing that same feat in100s of years, but that is still too long of a timeframe for most people to take notice in human terms. Nevertheless the harms are very real especially those affecting the poor, and eventually, maybe not this century, maybe the next, we have consigned a large portion of people in future generations to extreme harms. Silent Spring has to do with harms from pesticide use – which are substantial, especially for those who live(d) near plants that produced them and are now dying in droves, as in the town next to mine. The silent spring would be due to the lack of bird, due to the pesticides making their eggs a lot thinner (it also affects unborn human babies too). The “ice age scare” was in the 1970s and early 80s when there actually had been a decrease in global temps (probably due to the SO2 and other pollution, which was pretty high then). Scientists at the time didn’t have as good of knowledge about this “aerosol cooling effect” as they do now, and there were a couple of scientists who feared it could lead to an ice age…which like global warming would have taken centuries to millennia to manifest. I really wasn’t at all scared back then, but people who don’t know much about climate science may have been.